I think someone actually used the words “normal marketing” which made me laugh, but yeah, we do. However, you have to kind of find your niche and so I talk about online marketing, there are plenty of people who are fabulous at offline marketing. One of the best ways you could ever learn is to get Joe Polish’s Pirhana Marketing system I think you can even listen to on audible now and that is a bargain. But the information he gives for the carpet cleaning industry, which can be translated into any; we’ve used it in the fire extinguisher business also and that is just gold absolute gold. However, for those of you that have asked, I have made a little list, so I am going to tell you some things. These are easy by the way; they are not free, there’s probably some that are free. Some will involve a bit of printing but nowadays with Vista print and the competition that that’s brought up, printing is so cheap, it’s ridiculous. So, the first and the most obvious is leaflets. Leaflets are simple. Now if you are a local business and you don’t have leaflets, you are missing so much. There are so many things, so many ways you can do it. For example, if you are a plumber or an electrician or a painter and decorator, or a landscape gardener that visits people in their homes, why not have a leaflet that says that you have just visited their neighbor? Put that leaflet in four or five doors, either side and opposite of the house you just visited after every single visit. That can’t be bad, can it? Because it’s of interest to their customers, they will probably say yes, no problem. Or they might want to strike up a deal, but you’re going to build relationship. There’s so many ways. How about your business cards? What does the back of your business card say? If you’ve got a website, you’ve got an opt in, if you’ve been listening to me then put it on the back. Give a free gift, or a free audit, a free visit, something, put it on the back, “Your free gift, call 1-800”, whatever it is and ask for your free audit, free survey, free this, free that, or for your special offer, something like that. Most people don’t put anything on the back of the business cards, they are printing them, do it, and do the back in a different color, so that people when they look over, oh, it stands out. Then they can see the back. On ours the back are orange. In fact our business cards I think are black or white or orange and all of them have an orange back. We give people a choice it makes people think and people remember. When was the last time someone offered a business card and said. “Pick the one you want”? How about calling old, past customers and go and visit them and tell them what you do now. If you haven’t been in touch with someone for four years it doesn’t matter, what’s the worst that can happen? Say, “Hey George, remember me, it’s Jon from Marketing for Owners. I know we haven’t spoken for quite a while, but I’m in your area next week. What’s the harm in that? How easy is that? Remember, what are you scared of? What’s the worst can happen? How about joining network opportunities? You might have to get up early and go and have a breakfast, but the other one is speak at BNI gigs, you only get to do it once, but speak at other BNI gigs, introduce yourself to people. Why not join your local Chamber of Commerce? They have loads of events, go to all those, join in, get to know people. How about forming your own master mind group? Or you could join one. Generally a good mastermind group will have people from a diverse set of skills; they don’t have everyone in the same groups, so people bring different things to the table. But that means you can refer each other, you can find opportunities for your friends in your mastermind group. But if you start one, you can pick who you want to be in it. How about that? What about creating an event either on your own or with a partner? How about an after hours or a lunchtime event just for an hour, a couple of hours? Free sandwiches, free nibbles, coffee and so on and bring another speaker. An evening one is great. How about for your customers? Ask them to bring a guest, someone who they think may be interested, bring a guest. Easy, just rent a small place in a hotel, doesn’t cost much, or a local bar or a restaurant and just provide food. It’s going to cost you some money but you are going to get customers and you are going to build a reputation if you do them regularly and bring in other good speakers from partner businesses; that would be good because they’ll bring their guests along. How about speaking at events? I said about Chamber of Commerce, they generally hold events, speak at events. Contact other Chambers of Commerce in your area and ask if they’d ever like a speaker on whatever subject, to explain. And don’t forget if you, so earlier I mentioned say if you are a landscape gardener, you’re going to think, what, can I speak about landscape gardening? But how about, how you built your business, how you got your first customer. There are hundreds of people in that Chamber of Commerce who want hear how you got on. And that trials and tribulations of being a landscape gardener, you might think, “Well, who’s going to listen to that?” Loads of people, loads. Honestly. Go for it. How about getting on panels? Quite often at these events, they have panels where there are multiple people sitting on the stage to answer questions. Get on one of those, it adds expertise authority. What about creating a meet up? Meetup.com has lots of opportunities for meetings, you should be going to some in your area. Why not create your own? So if you are that landscape gardener, don’t expect it to be all landscape gardeners, say small local traders and invite people, ask others to come, don’t expect them to just turn up. And then make it good. How about starting a coffee club? How about starting a book club? You build a reputation and you could can talk to each other about business and refer each other and say, “Oh, I know someone. Let me have some of your cards, I know someone who needs a plumber”, that kind of stuff. What about getting the name and e-mail of every single person you meet anywhere and add them to an e-mail list? That’s free. So when you meet someone when you, at this event say, have a little pen and a pad, or ask for the card, if they haven’t got a card. You’ll be amazed how many people will say, “Oh, okay then. I’ll give you the e-mail.” Or you can just ask for a card and just add them to the list, they can unsubscribe. There are many, many more ways, so, what were you worried about? Get to it, get going. Look it up, ask, there’s lots of ways, okay. 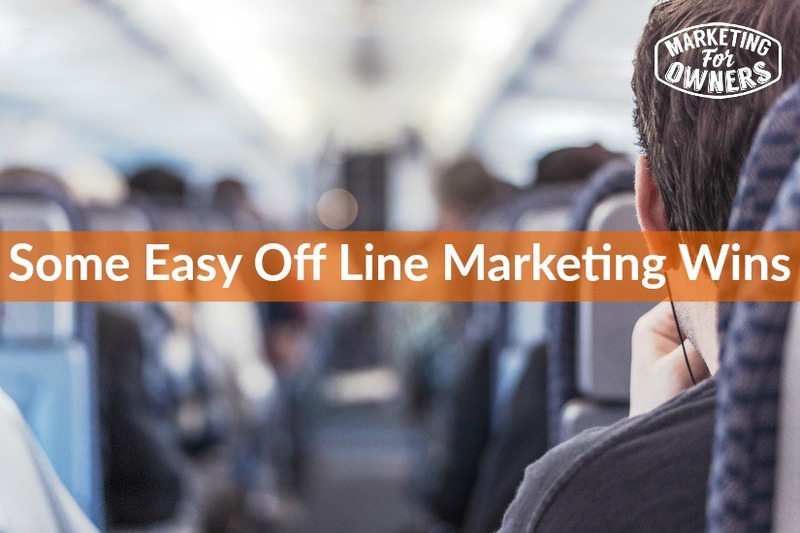 There’s ways to market off-line, online, it’s easier than you think. Today, is Wednesday which means it is time for a friendly follow. 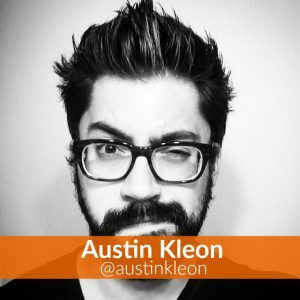 Today our Twitter friend is Austin Kleon. He is an author, a writer and an artist. It’s hard to explain, the guy is brilliant, absolutely brilliant. Just go look at his stuff. So go to his Twitter handle, which is @AustinKleon. His website is probably austinkleon.com, I can’t remember off the top of my head, but look up his books. You can Google him, the guy is a genius. His drawings are fantastic; it’s in a sketch notes type of way. Just go see what he does, honestly it’s remarkable. I think it’s wonderful. I’ll have something more for you tomorrow. It’ll be good. What offline marketing tactics are you using?